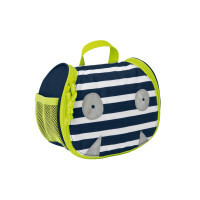 Product information "Mini Washbag, Little Monsters Bouncing Bob"
description & equipment It's time for vacation with the Lassig toiletry bags with the monster design! 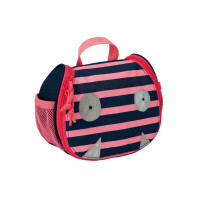 Both toiletry bags feature a well organized main compartment that fits all kinds of care products such as a hair brush or shower gel. Toothbrush, toothpaste or even small hair clips can be placed in the two inside mesh pockets or in the separate zipper pocket. The hook for hanging the bag and the removable mirror included in the set are especially useful. 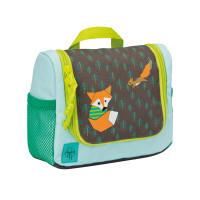 The two side mesh pockets are ideal for wet items, complementing this practical accessory. The eyes and teeth of Bouncing Bob and Mad Mabel glow so anyone can find the toiletry bag in the dark. The clear name badge sleeve on the back side also helps prevent bag mixups.